That detestable man is back in our midst. How unfortunate that he shares – with only a minor variation in spelling - the name of the town’s most famous son. Yes, we once again have the pleasure of ‘Major’ Davey, back in Penzance after his all too brief visit to Bodmin. He is no relation of the great chemist and his eminent family. And, it must be said, he is not properly a major either. This man has not been promoted for his valour on the Dark Continent. He has not, to my knowledge, so much as wielded a sabre in the face of the nation’s foe. Trouble? Of course there was trouble. In Queen Street, both inside the Salvationist Barracks and out, what can only be termed the “rough element” had gathered in force. And their opponents – those partial to a the cup that inebriates and does not cheer – were there as well, so we had “howling and hissing”, “shouting and disturbance”, drowning out all the “volleys” of “Amen!” and the oft-heard so-called hymns, though no doubt the congregation were giving vent to Hell’s Legions Have Gathered, O Every Land is Filled with Sin, Accept my Youth, my Strength, my Prime, and so forth. 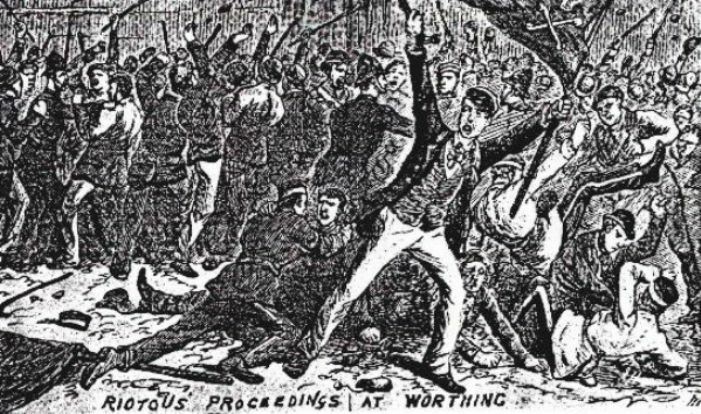 ‘Major’ Davey has served his time at Bodmin for obstruction, and no doubt will shortly busy himself again, with his butcher’s boy followers – reformed sinners for the most part – strutting about in their uniforms, blowing on their instruments and calling sinners to repent. They block the thoroughfare outside the First and Last, and hinder trade. They intimidate customers doing legitimate basis at the wine and spirit merchant’s. There’s been similar trouble with them in every town. His supporters proudly broadcast the details of what their leader has suffered for his defiance of the law. They say that, while he was in Bodmin, the ‘Major’ had no other meat than a beetle in his porridge: seeing it, he merely “asked the Lord to sharpen his appetite”, and ate calmly on. Word has it that he was told by the warders to cease singing hymns, as “he could be heard all over the prison”, and it set a bad example. I say that a beetle in the porridge is better nourishment than he should ever have from my hands. I say that – notwithstanding this is England, and a free country – the bellowing of hymns in the faces of those going about their lawful business is an affront to the senses. Salvation? We shall see. When this earthly life is past, ‘Major’ Davey; when the Last Trump sounds – then we shall see.